Started by the Internet expansion in the 1970s and the subsequent large-scale adoption of the World Wide Web in the 1990s, information revolution has drastically changed business models and gave the birth to the new economic players. On the one hand, the Internet yielded remarkable implications on economies involved, once allowing creation of the new markets characterized by a large scale, increased customization, rapid innovation and collection and usage of detailed consumer and market data. On the other hand, digital tools have created the new economic players – the Internet platforms represented by, for instance, e-commerce, online media, job matching, financial trading or social networking. The latter provided the powerful tools to considerably decrease transaction and other costs related to creating and distributing certain types of products and services, acquiring information about these goods, or most remarkably collecting and using data on consumer preferences and behavior. Consequently, in our century, digitisation, information communications technology (ICT) and the Internet have become key drivers of global wealth creation and socio-cultural development. While describing the above-mentioned economic trends, one may reasonably argue that the recent literature on economic growth should put the research focus on building the common comprehensive understanding of new economic mechanisms and the ways in which new technologies change economies involved. This e-book is such an attempt to join the efforts and bring the new insights in the literature on digital ecosystems that are commonly created by the usage of the Internet and uptake of other digital tools. While inquiring the main elements, characteristics and the structure of digital ecosystems, this e-book refers to start-ups, high-tech sectors, ICTs, innovations, intellectual property rights and the efficiency of market regulated by algorithmic financial operations. The economic part of this e-book starts by the paper of Skala and Giezynska. Based on their pilot study covering a sample of start-ups, the authors discuss whether we should translate digital criteria into high-technology. High-tech industries, as the fastest growing sectors in economy, are further addressed by Akhvlediani and Sledziewska. Namely, the authors examine the export performances and intra-industry trade of the core and the new EU member states in the high-tech sectors and find considerable gap between these two groups of countries. The analysis is further extended by the paper of Brodzicki, who, based on a large firm-level survey, finds strong positive correlation between innovation and exporting potential of firms and thus highlights that the export performance of a given firm, may be linked to its superior innovation performance. While discussing the other possible ways for improved performance of enterprises, the paper of Gołuchowski and Szarański puts the research focus on the importance of ICTs and suggests that broader uptake of ICT advantages and therefore the development of enterprises depends on possible cooperation at the market. As an illustration the authors consider clusters to gather companies for both competing and cooperating. Furthermore, Grodner reports the results of her own market research elaborating the importance of mobile marketing in building a company’s competitive advantage. Other digital tools for information distribution are addressed by Ratajczak. The author discusses the aspects of information distribution at high-frequency trading and challenges the efficiency of market regulated by algorithmic financial operations. Finally, Mika refers to the recent global information transmission by outlining the main causes of ambiguities and inconsistencies of the concept of intellectual property rights. Based on the “rental theory of ownership”, the author convinces a reader that legally guaranteed socio-economic relation, arising on the occasion of the creation of information commodities, is indeed an ownership. To conclude, the papers presented in this e-book introduce the new perspectives and original approaches to conceptualize implications of information revolution and digitization on recent economies. 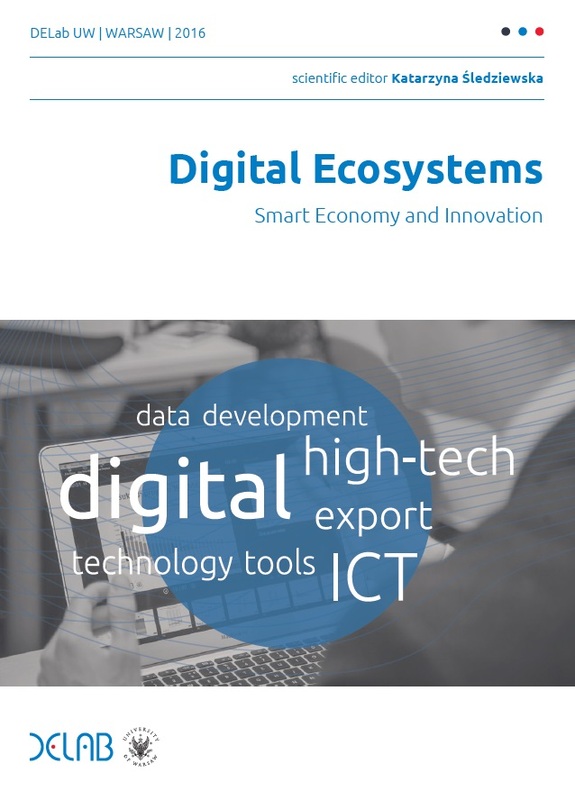 We believe that the authors’ efforts should contribute the literature on digital ecosystems by bringing new insights and raising new research questions to explain current puzzling digital trends in the economies involved.